You don't normally see a retractable refreshment area, or rather, you don't normally see a refreshment area created by installing of a temporary building, that disappears to leave space for the transit of vehicles and equipment. It doesn't happen every day, but sometimes it does! 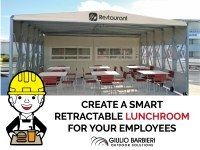 This is the case of a French company operating in the field of energy production that has relied on Ready Box 2 to make the lunch break of its employees more comfortable. 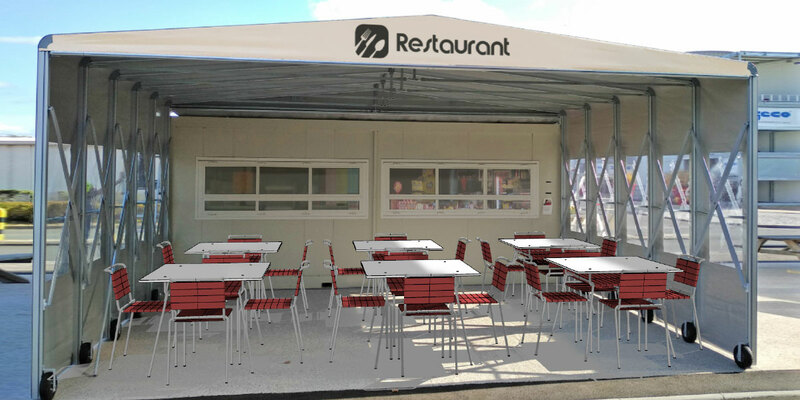 The retractable canopy allowed the company to quickly obtain an external area that can be used as a catering area without affecting the construction times and without having to make any changes to the movement of vehicles. The speed of installation and the functionality of the structures were a perfect fit for the customer's logistical requirements, creating a solution that satisfied the employees and the company in an exceedingly short time. The case history in detail In the absence of an internal canteen and set in a predominantly industrial context, lacking in catering options, the French company was looking for a solution to allow its employees to have their meals in the most comfortable condition possible, without forcing them to travel long distances during the lunch break. 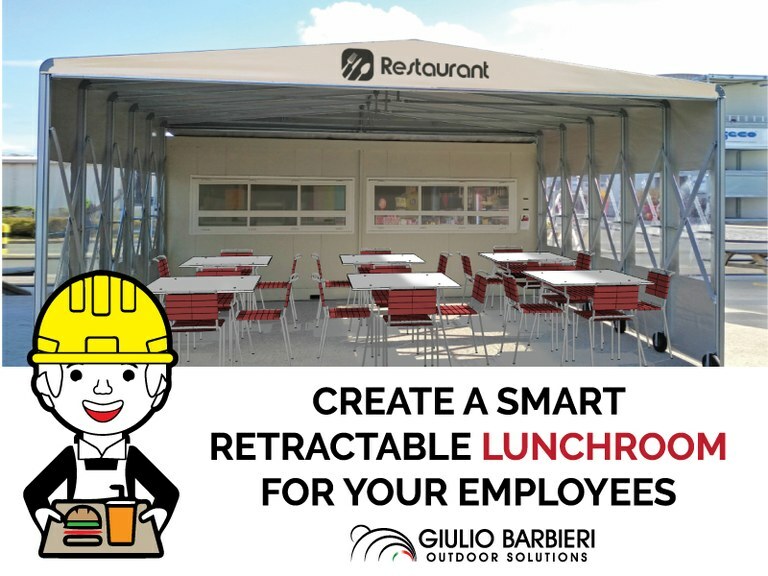 Taking advantage of the only kiosk in the area, located opposite the production area, to which a retractable aluminium tunnel (Ready Box 2) was added, the company could easily create a sheltered dining area that transformed the way that the employees spend their lunch breaks. The reasons why the company decided to opt for an industrial structure instead of choosing a more traditional veranda or pergola, are simple and can be summarised as follows: - a tight timeframe for the implementation of the project - the need for a non-permanent solution - the need to quickly dismantle the refreshment area to allow the movement of vehicles on their way to the company buildings. The temporary building has thus proved to be the winning choice as it is a mobile modular structure, easy to fold away thanks to a pantograph system that opens or closes the PVC cover sheets - very handy to use and, if necessary, easy to move. The company has also chosen to customise the structure and make it more welcoming and informal by opting for cover sheets with side windows and branding the temporary building with an icon and an inscription related to the catering sector. In addition to the practical side, therefore, also the aesthetic side has been taken care of as much as possible, helping to create a functional, efficient, and extremely versatile project.